I’m not really into New Year’s resolutions, but this year I did decide to make a greater commitment to using eco-friendly material in my jewelry. To this end, I’ve started buying most of my sterling silver from Hoover & Strong, a company that has been providing eco-friendly, recycled precious metals to jewelers for decades. While I do still have a lot of material from other suppliers on hand, I will be restocking these with their more environmentally-friendly counterparts as they run out. I am already using the recycled silver in many of my pieces, including my Constellation Earrings, Galaxy Ring, Skyline Earrings, and several other items. I’m happy with how the silver looks, and I feel good about using something that is a little less harmful to the planet. In other news, I’ve finally gotten around to updating my shop at Big Cartel. I like the different formatting options there, as well as the reasonable monthly fee. Click HERE to take a look at the whole shop! 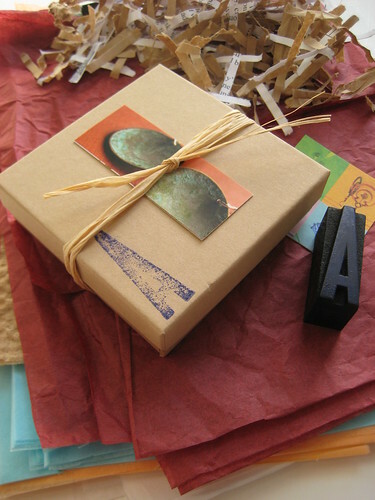 Packaging, originally uploaded by antigenre. I had tons of packing paper that I received with my Rio Grande orders just sitting around, so I decided to cart it off somewhere and shred a bunch of it (I need my own shredder). It is working nicely as filler and cushioning for my packages these days, and I’m using as much recycled and repurposed material as possible in general for packing. I always enjoyed wrapping presents during the holidays and was often conscripted by my family members to do their gifts for them. Needless to say, I’m having a lot of fun with my more elaborate packaging set-up now.